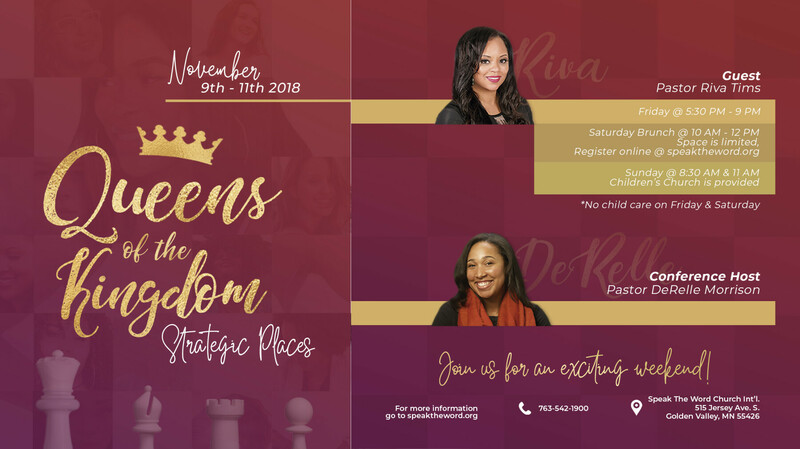 On Friday, November 9th, please join us for the kick off of our women's conference, Queens of the Kingdom: Strategic Places with Pastor Riva Tims! Come learn about how God is placing you in strategic places and that no matter where you're at in life, you are a queen! Enjoy some delicious hors d'oeuvres & fellowship @ 5:30pm, followed by a powerful service @ 7:00pm with awesome worship & Pastor Riva Tims! And don't forget to join us on Sunday! *Registration is not required for Friday 11/9 or Sunday 11/11.